A three quarter length portrait of a man standing in a homestead holding a baby on his hip, who seems to be yawning. The well constructed hut in the background has an extended thatch over an entrance area at the front. Note on print reverse ms pencil - "41 2" & print front border ms ink - "NUER IX/36"
Morton, Chris. 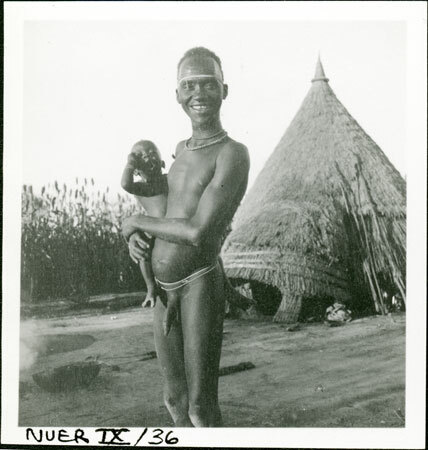 "Nuer man with baby" Southern Sudan Project (in development). 03 Jan. 2006. Pitt Rivers Museum. <http://southernsudan.prm.ox.ac.uk/details/1998.355.415.2/>.